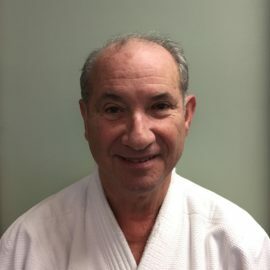 Aviv Goldsmith Sensei began Aikido training in 1975 at the New York Aikikai. 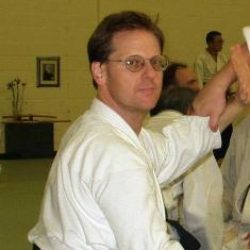 In 1986, he began studying Iwama-Style Aikido in Reno, Nevada, with Wolfgang Baumgartner Sensei being his primary instructor, and has enjoyed deepening his understanding of this Aikido tradition ever since. “Iwama-style Aikido really made sense and stuck with me more than the other styles that I had previously studied. The teaching methodology and the techniques are precise and easy to assimilate,” he reminisced. From 1987 until Saito Shihan’s passing in 2002, he trained annually with Saito Morihiro Shihan, 9th dan, and continues this tradition by training with senior Iwama-style instructors around the world. Saito Shihan awarded him the second-level weapons mokuroku (teaching certificate). He hosted Saito Shihan and his son on numerous occasions. 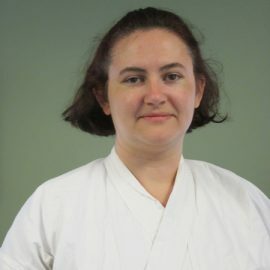 From 1993 to 1999, Aviv Sensei was the Chief Instructor of Reno Aikido Co-Op. He and his wife moved to Fredericksburg in 2002 to make Aikido a focal point in his life and become Chief Instructor at Aikido in Fredericksburg. Aviv Sensei supports the Aikido community by serving on the board of the Takemusu Aikido Association and previously, Aiki Extensions. 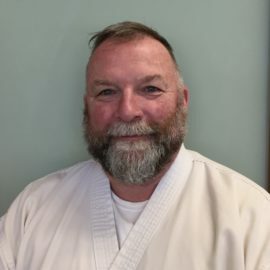 In addition to teaching at Aikido in Fredericksburg, he has taught at dojos and seminars around Virginia and in Nevada, California, Louisiana, Arkansas, Florida, Maryland, Montana, New York, and Rhode Island. 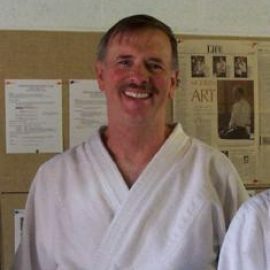 He has taught Aikido at Community Colleges in Nevada and Virginia and at the University of Mary Washington. In May 2010, he was awarded the title of “Shidoin” (certified instructor) by the Takemusu Aikido Association. Most recently, he was promoted to 6th dan in January 2014 at Aikikai Hombu Dojo in Tokyo, Japan.